WE WERE happy to catch up with our old mate Andrew Brown from Midway Point up at Brighton on a beautiful early spring day. 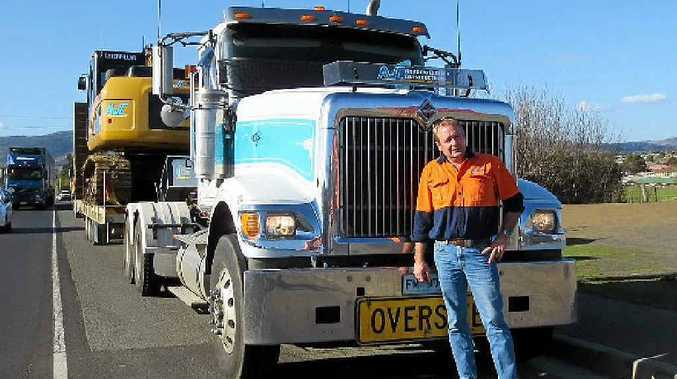 He was driving a 2006 AWC Constructions International Eagle 9900i with a C-15 Cat up front and towing a float with a Caterpillar 324D Excavator on the back from Swansea back to Hobart via Lake Leake. He tells us the truck has just had a bit of an engine re-build, new head, six liners, six pistons etc, and is now "refreshed" and running like clockwork again. Andrew also tells us he has been with AWC Constructions for seven to eight years now and that he enjoys the outfit, the work and the variety, working all over Tasmania. In parting, he added "go Cats!"